This week, I’ve been heavily re-developing my hobby project TTTO at home and at work, re-developing our CMS. It’s been fun and time passes very fast. In the blink of an eye, Friday is here and now I feel I can play FFXI all day this Saturday without feeling guilty that I’ve wasted another week being unproductive. As usual, so much to do, so little time. I’m considering buying Yomeishu to assist my busy life. Has anyone drank it regularly before? Today, I planned to visit Nakano Broadway, which I learned from Danny Choo’s post that it was another otaku heaven. Check his post for many photos which I didn’t take. From Asakusa, I took the train to Ueno. Before I took the next train to Nakano, I decided to explore the park there. Along this long corridor to NB, there was a family restaurant called Lotteria. I had my breakfast here. The burger had a half-cooked egg which I loved. The first 1 or 2 floors were normal shops, 3rd and 4th had a lot of anime-related shops. There’s also quite a few costumes for cosplayers. Mandarake had quite a few shops here too, and they also have a few more on the 4th floor which are used as storage rooms. After that, I headed down to Sunshine City. I wanted to take a look at Otome road, which I thought was somewhere along the way, but I probably took the wrong path as I didn’t see any female-oriented shops along the way. There was a tower here, around 60 storeys tall. On the 60th floor was an observation deck where I spent most of my time hanging around. Then I remembered Japan’s early sunset so I spent about 2 hours here. 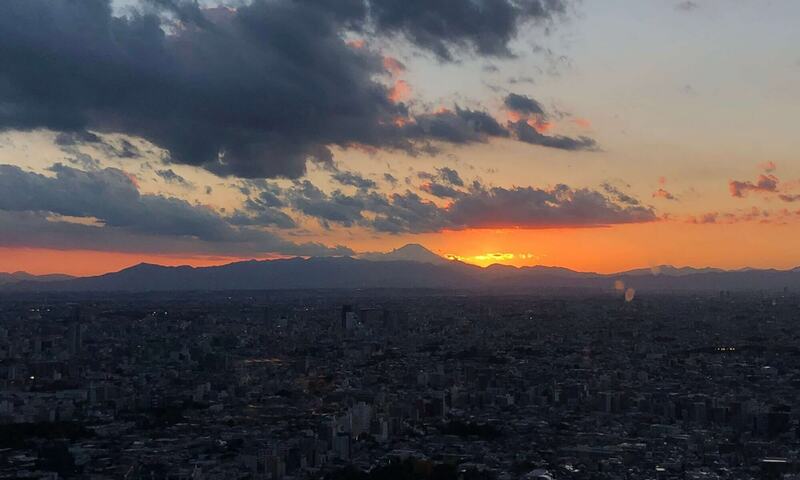 I chose a seat where I can see the sunset and it just so happens that Fuji mountain was also in the same direction. I had spaghetti for lunch and had orange tea while reading a Haruhi novel on my PSP. Halfway through, there was a commotion from some of the children and they were running around. Looking out the windows, I saw a blimp and it circled around the building before it floated away. Then came sunset. A woman in her 40s sitting on the table next to mine had a mug of beer ready and already basking in the orange light from the setting sun. You could see the shape of Fuji mountain clearly. I had my digital camera filming the sunset as I stared blankly at the scene. After it was over, I set off for Tokyo Tower. I didn’t go up the tower, just walked around the area to see it. My feet was aching badly so after a look, I went back to my hotel to rest. I slept from 1am to 9am. Had my morning coffee and went out to meet Z. He’s accompanying me around a few places today too. We were meeting at Tobu Asakusa Station, near my hotel. There are 2 more stations at Asakusa area which was what confused me at first. I wanted to visit the Tokyo Big Sight. An exhibition center where many doujinshi/cosplay events are held. It took us an hour of train rides to get there. I still can’t forget this beautiful Japanese girl with short hair who was standing in front of us on the train to Big Sight. On the right side, that’s the Fuji Television building. Earlier, I had looked up Big Sight’s website and noticed the 2 events held today, Comic City and a cosplay event. First, we went to take a look at Comic City at the East hall. I don’t know if it’s just me but I noticed most of the artists there are females. I was given a catalog when I paid for the entrance fee. Perhaps I’ll check it out when I’m free. We tried to look for any FFXI related doujins but sadly, there weren’t any. We left shortly for some nice hot takoyaki outside in the cold. Till now, I still miss the cold weather there. We went to the West hall next, there was a huge cosplay event going on inside, but we didn’t go in as I didn’t want to make Z pay for the entrance fee for something he doesn’t have interest in anymore. Just looking in from the outside was good enough for me. We then left for Meiji Shrine. There’s some celebration going on, I think it was the 3-5-7? So the area was pretty crowded. The road in was of granite rocks. Here at the shrine, I bought a small "omamori" charm, for good health of mind and body. There were many other different charms like love, fortune and traffic safety. 3-5-7 is a festival for young children, so you can see a lot of them dressed in colourful clothes. A wedding ceremony was also carried out on that day! Lots of people were watching as the newly wed couples walked slowly. Next we visited the inner gardens. I was expecting to see lots of flowers but sadly, they were gone. According to Z, it was the wrong season for flowers. After dinner, he had to start heading back home. So I went exploring Shibuya on my own. Shopped for CDs at Tower Records and had coffee at StarBucks. From the second floor of this StarBucks restaurant, you can see the train station and a crossroad in between, you can see lots of people walking around. 2008 is here, will everything be fine? And it’s been 4 years since I’ve started blogging. So much has happened in the blink of an eye. The things I’m proud of in 2007, the creation of The Tarutaru Times Online, with the help of friends, I planned and visited Japan alone and using my own money and reducing my FFXI addiction. Although now I’m addicted to another game, Monster Hunter Portable 2, I don’t know if it’s good or ending up back at square one. At least, I’ve begun catching up on anime and other interests. I spent the last few days of 2007 enjoying Monster Hunter 2 with friends instead of logging in to FFXI. Anyway, enough of MMORPG talk! I heard that a new condominium will be built on the empty plot of land behind AMK Hub. Though it’ll be a lot more expensive to buy a condo than a HDB apartment, that will be my first choice until I can confirm it’s price. I watched the first season a while back, pretty mysterious, scary, disgusting, but still, I watched the second season to find out what the hell was going on actually. And like what many others told me, it explains everything. I wonder what story will the 3rd season tell since everything seems pretty much complete. Perhaps the background story on oyashiro-sama? Anyway, here’s a song from the higurashi game that’s been haunting me for the past month. Enjoy!